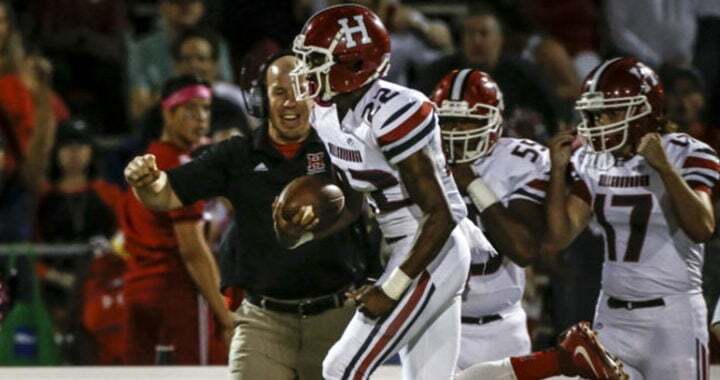 As signing day came to a close on February 1st, Duran Bell sat down with HHSFA Executive Director Vanessa Oatman for a candid interview about his future in college football and what it takes to reach legendary status. Vanessa: Duran, tell us the story of your long term commitment to USF and finally getting to signing day. 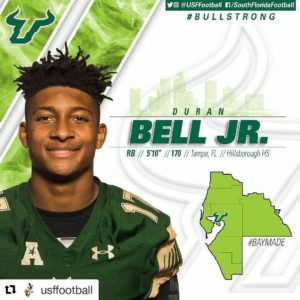 DB: I received my first offer from USF in February of my junior year from Coach Woodie. After that offer came, I had about 17 more college offers come my way. Tennesse, Syracuse, Kent State, FIU and a bunch more. I finally decided to commit to USF in July 2017 right before my senior season started with HHS. Vanessa: With that many offers in hand, what drove your decision to commit to USF? DB: My junior season was plagued by injury after injury after injury. It was very discouraging. Going into my senior season, I wanted to make sure I secured my spot with a college team who wanted me for my talents despite one bad season. Over time my relationship with the coaches at USF grew more and more. It made it easier to commit to them because I felt like they knew me on more of a personal level. Once I committed it was like being engaged, the offers from the others teams stopped coming and at that point I was all in. Vanessa: There was one school who didn’t seem to mind your “engagement” with USF. Tell us about UMass. DB: UMass showed a lot of interest despite my commitment to USF. I did go on a visit there just to be sure that I was making the right decision. They had a lot of great things to offer – great degree programs, the head coach previously won a Super Bowl with the Steelers and there are a lot of good business opportunities in the area for college students. A lot of great perks. Vanessa: What kept you from changing your mind? What made you decide to stick with USF. DB: The biggest thing was my family. I have a very supportive family in Tampa. My grandparents are a big part of my life and I want them to be able to come to my games. I’m the first person in my family to make it to a D1 school. So its really a big deal to us to celebrate that together. I also feel like the relationships I have with the coaches at USF are authentic. Vanessa: This past football season really set the tone for winning with our bay area football teams, from HHS to USF to the Bucs. How did that impact you? DB: I think the spirit of winning started with our redemption season at HHS. We went 8-2 and landed ourselves in the first round of the playoffs after a 4-6 season in 2015. USF has been on the rise the past couple of years and seeing them go 11-2 this season gave me high hopes. I think USF can be in the Power 5 and I hope I can be a part of that. Vanessa: What has being a football player at HHS done for you? What will you walk away with when you cross that stage for graduation in May? DB: HHS Football has taught me two things… work ethic and time management. When I came to HHS I had to get better in the weight room. You don’t get on the field just because you’re a good athlete. You get on the field because you work hard and prove you are worthy of wearing that H on your helmet. Time management is also a big one for me. If you’re not on time, you don’t play and it gets more important as you head into college. Being late could cause you to sit the bench, or worse, lose your scholarship. Another big thing I will take away is the relationships I gained. My friends Armand (Chalk, LB), Nate (Dantley, WR), CJ (Williams, WR), Russell (Booth,RB) will be my brothers for life. I know our friendships will last a lifetime like a lot of the football alumni who played here. Vanessa: What advice would you give the incoming seniors who are waiting on offers or hoping to play college football? DB: Continuously work hard and be patient. Most people don’t start getting offers until the beginning of their senior year. Go out there and show your talent and a college will notice you. Put in the work. Vanessa: Ok Duran…lets talk HHS Hall of Fame. In 2027, the HHS Hall of Fame committee will be meeting and adding 2017 players to the inductee list. Will we see your name on that great wall of legends 10 years from now? DB: I would love to be a part of the Hall of Fame. There are people like Coach Longfellow and Coach Henderson who are legends at HHS. People who played football many years ago who just got inducted into the hall of fame recently. I would love to be inducted but I understand that its more than just playing the game, its donating, contributing, coming back and giving time. Wow, I want to be on that wall one day next to the ones who really made a difference on and off the field.